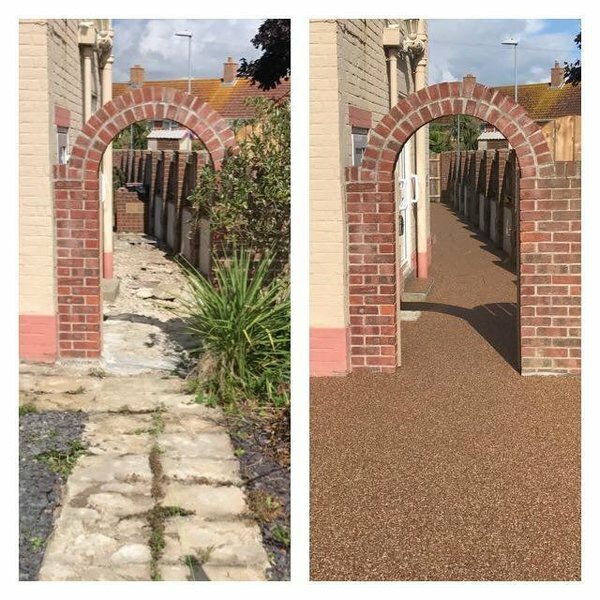 Dorset Showhomes specialise in Resin Bound. With over 450 successful installations, we truly are the experts in what we do. We are also approved by various insurance companies to repair or replace work done by other companies. We offer insurance backed guarantees, a deposit protection scheme and have over 30 colours to choose from. 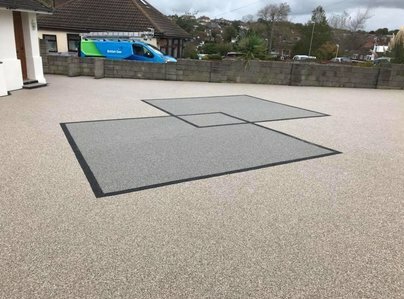 Resin Bound surfacing is anti-slip, anti-puddle and anti-fade. We can replace entire sub-bases and complete any and all landscaping works required alongside the project. For a free, no obligation quotation, contact us today to book your appointment with one of our highly trained surveyors. We had a new resin driveway laid. We were kept informed as to when the work was going to be done (weather permitting). It was done over 2 days, 1 week apart. Service throughout was excellent. The workmen were polite and hardworking, and made an excellent job of laying the driveway. The only problem was palettes & other work materials were left on the lawn for 4 days before being collected. Surfaced with resin the path to our front door and the side of our house. All looks beautiful and was commented by all neighbours that passed by. 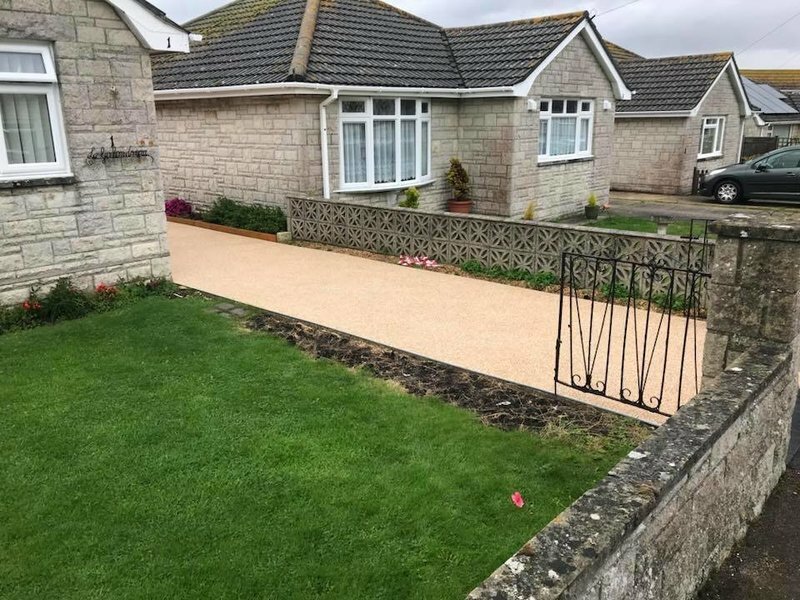 Resin bound drive, 159 sq. metres. Whole team polite, professional and skilful. Men worked like trojans non stop. Finished job is brilliant, Done on schedule and to budget. Bling brought to my back garden! Company rep who came and quoted, not pushy at all and really knew product. Weather defeated initial attempts to lay resin (not company's fault) but each time kept well informed. On day of application fitters were on time and very polite and helpful. Excellent customer service when you telephone company. Great job finished on time and budget 10 year insurance backed guarantee installed by a polite Albanian family team. (Brexiteers note!) Looks fantastic and great compliments from neighbours highly recommend this company. Dorset Showhomes put in a resin driveway, they were on time, prompt & very helpful and did an excellent job. We would have no hesitation in recommending this firm and their work force. Resin driveway installed. Installation was agreed when weather conditions were suitable. Installation was efficiently carried out with a good effect by the team of installers. Removal of all packaging and residue completed to my satisfaction. 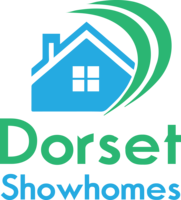 Contact with Dorset Showhomes Ltd has been good with a happy and informative staff. Well done with good teamwork. I am a very satisfied customer. On time and on budget by a polite and efficient team. Very pleased with finish and would recommend this company. (10 yr. insurance backed guarantee).